Given how rapidly business communications have evolved to incorporate social media, collaboration platforms, and—yes—even text messaging, archiving the data in these disparate endpoints for regulatory compliance purposes can seem daunting—and reaching compliance without impacting productivity even more so. Luckily, new tools and practices have simultaneously emerged to simplify and automate the process of capturing and archiving data. 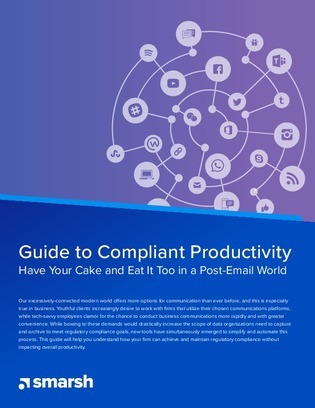 Downloading this guide will assist you in achieving and maintaining compliance without impacting users’ overall productivity.